You are here: Home / breakfast / How Are Rice Krispies Made? How Are Rice Krispies Made? There is a difference of opinion on how Rice Krispies are made in the factory, and of course Snap, Crackle, and Pop aren’t about to tell us how we can make our own at home! However, it’s fair to say that it involves a similar concept to what makes popcorn pop, only Rice Krispies are much, much harder to make in our kitchens. Some say that Rice Krispies are made from a combination of rice and sugar that is made into a paste, and this is then formed into rice shapes before being baked. Others say that Rice Krispies are just puffed grains of rice, which are made by cooking rice, drying it out, and then toasting it until it puffs up. Why Can’t We Make Rice Krispies at Home? A failed experiment. The rice has puffed up a little. Well, you can, but it is very difficult and not always successful. I don’t want to put any kitchen science experiments onto Mini Yummers that are going to waste your time and leave you feeling as down as a soggy Rice Krispie. I’ve tried several times and without success. Rice is harder to ‘pop’ than popcorn, because the outer part of rice is much much harder than the outer part of popcorn kernels. This is why you would need to cook the rice first, to soften the outer part of the rice. You would then need to dry out your cooked rice a little, although still keep it a little wet. Remember when we made popcorn? We needed starch and moisture inside our kernel so it would make steam. The steam pressure inside the kernel is what made our popcorn pop. You would then need to introduce heat, again, just as we did when we made popcorn. It is likely that the actual ‘Pop’ of Rice Krispies is created by introducing high pressure steam to make your rice grains puff up and expand. Some things are just best made in a factory, and Rice Krispies is one of them. However, this doesn’t mean that we can’t have some Rice Krispie cooking-and-science fun! The Science Bit: What Makes the Snap, Crackle, and Pop Sound? 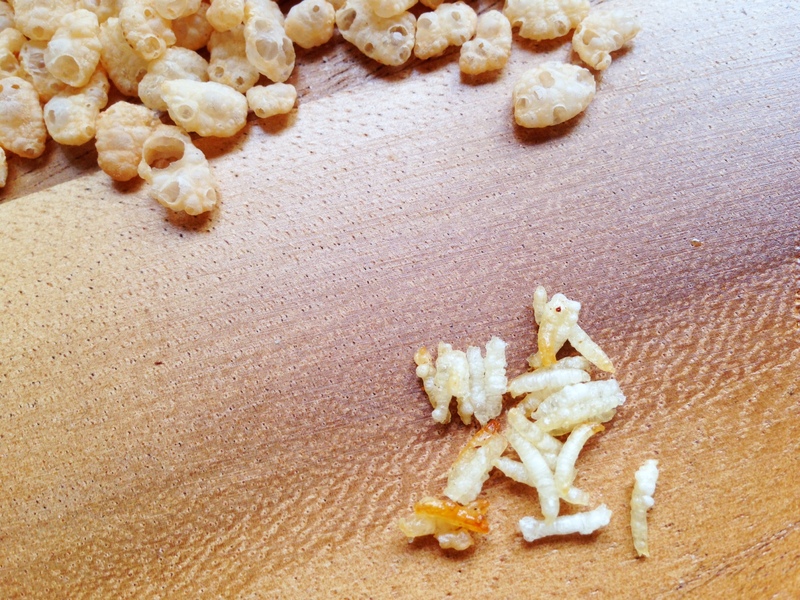 The Rice Krispies that leave the factory have very thin, crispy walls and are mostly hollow inside. 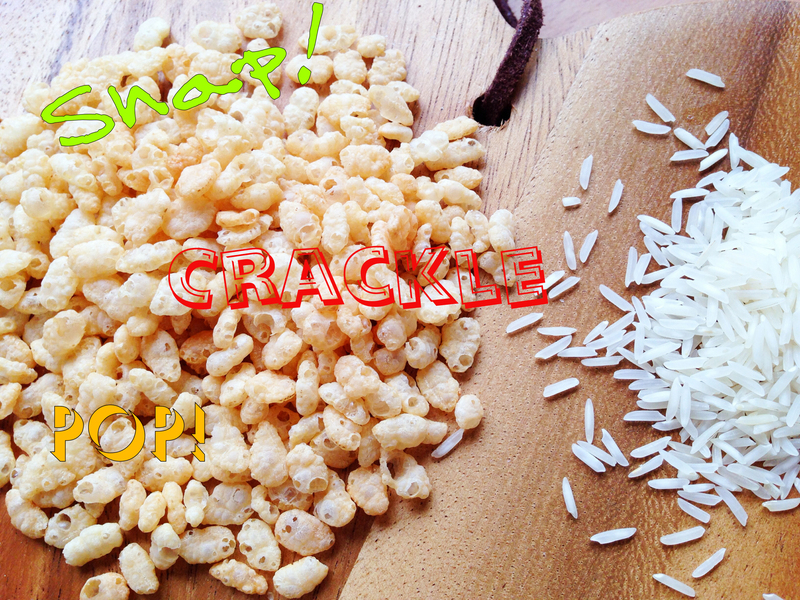 When the Krispies experience a change in heat, the walls collapse and make that Snap, Crackle, and Pop noise. Do you think cold milk makes your Krispies snap, crackle and pop even louder than if you use warm milk? Try experimenting. 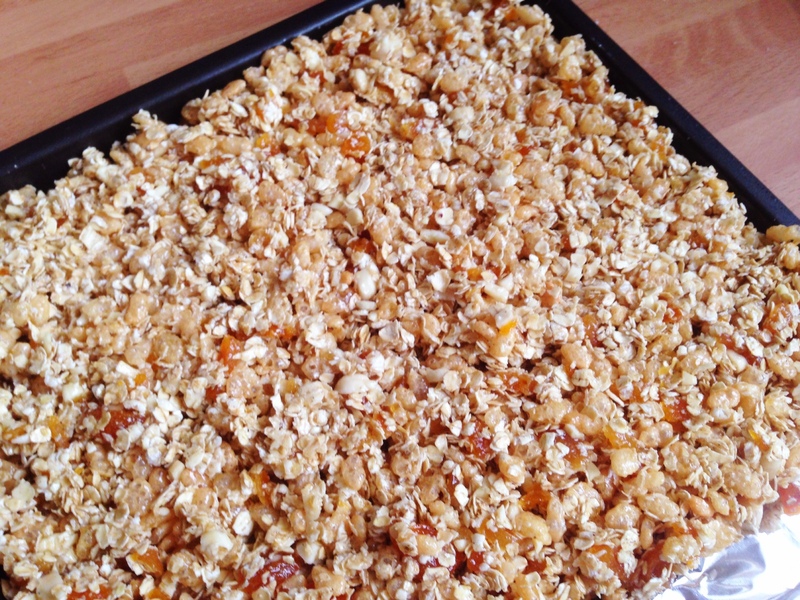 So we might not be able to make our own Rice Krispies at home, but we can certainly use them in our cooking. 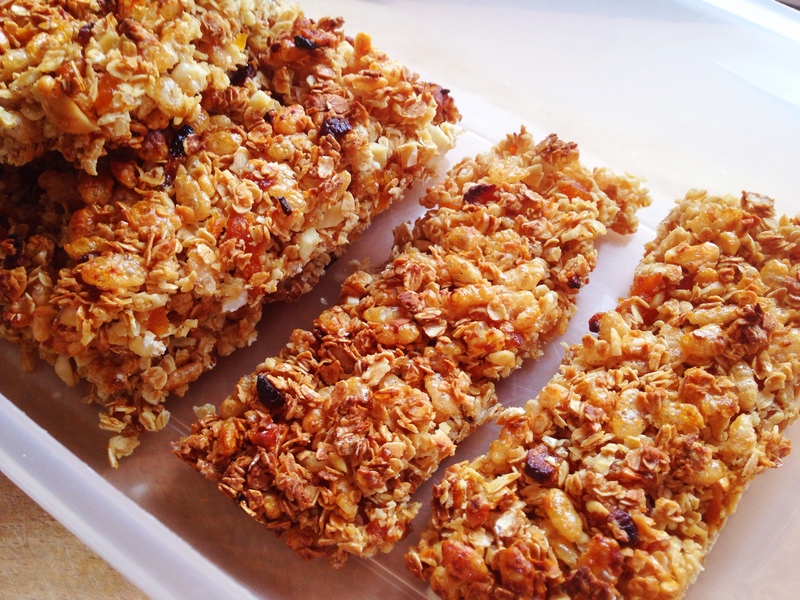 Crispy cakes, or Rice Krispies Treats bars, are certainly yummy, but I know a much better recipe and it’s healthier too. 1. Pre-heat the oven to 180c, 350f, gas 4. 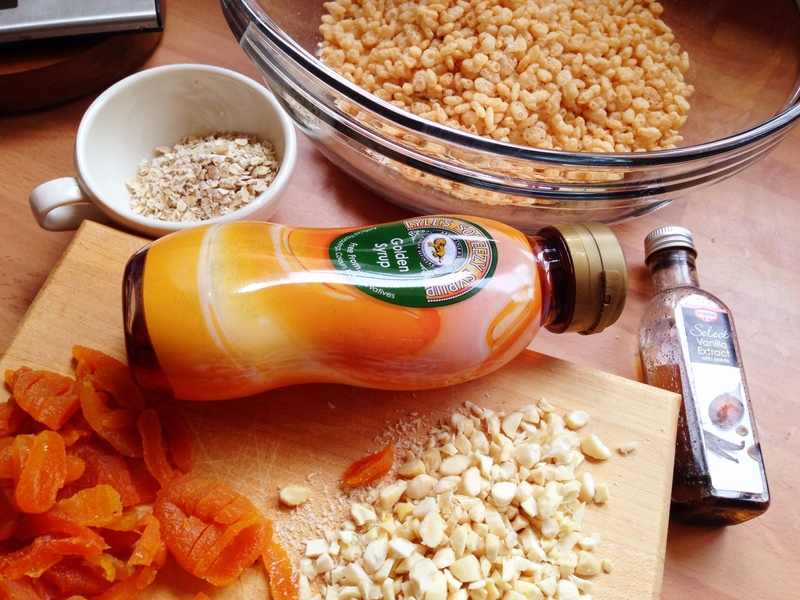 While your grown-up is chopping up the nuts, you can get snipping up the apricots using scissors. 2. Put all ingredients into a bowl and mix together well. 3. Press into a 20cm/8 inch square tin. 4. Bake in the oven for 28 minutes. Give it a couple more minutes if it doesn’t look ready. It should be just starting to turn golden around the edges. 5. Get a grown-up to cut it into bar shapes while it is still a bit warm and soft–it hardens up as it cools. What other combinations of cereal, nuts, and fruit could you use? Let us know your favourite flavour combination, and how you got on with your Rice Krispies milk experiment.